I bought another rug. This time for our bedroom. Yes, I realize it seems like I have a rug fetish, but I don't. Really. I've been wanting a large rug for our bedroom for quite some time. 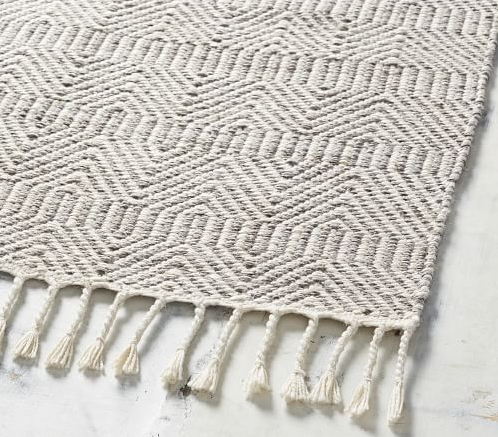 Then I received a Pottery Barn catalog and noticed a collection of indoor-outdoor rugs that looked nothing like typical indoor-outdoor rugs. After reviewing the options, we settled on the Lucca rug. Hand woven of 100% polyester, it is very soft underfoot, something we're not used to. Our floors are hardwood and tile, and our rugs are either natural sisal or wool, or tightly woven indoor-outdoor rugs that mimic sisal. Nothing soft, until now. The Lucca rug is plush and feels so luxurious – perfect for the bedroom. It makes the room look larger and more finished. It covers the wood floor scratches and softens the sound of their creaky boards. 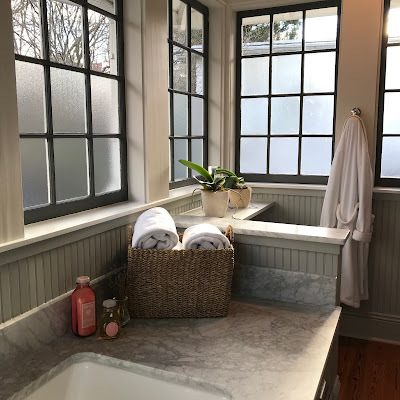 Best yet, it is super affordable. I paid less than $280 for the 8' x 10' size. 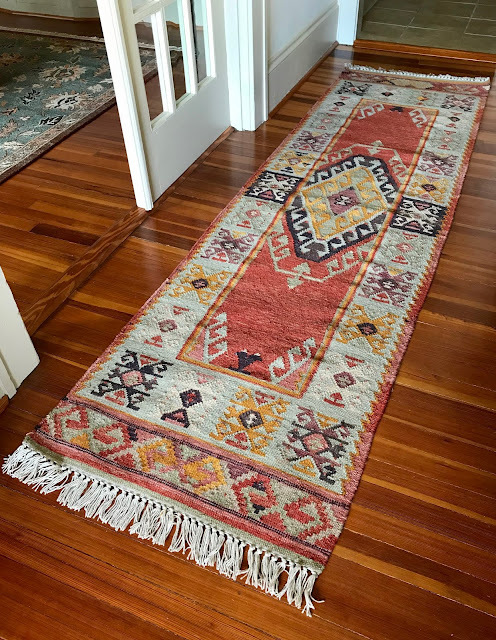 Even though it is washable – a trademark of indoor-outdoor rugs – I'm fearful one of our dogs will throw up or have an accident on it. 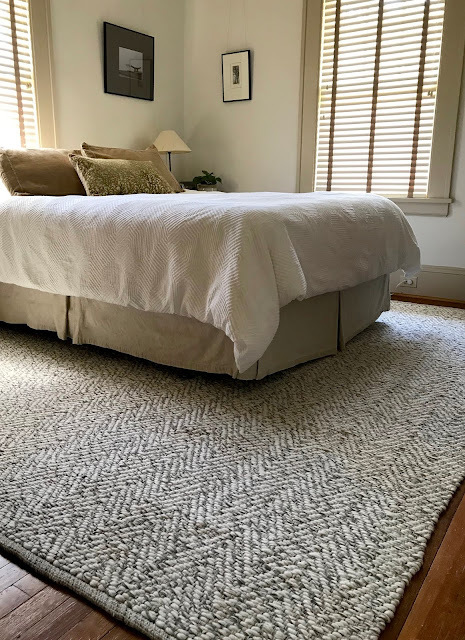 The rug is large and goes under the bed, so it isn't easy to take outdoors and hose off, like our other rugs. Fingers crossed, there will be no accidents! so that everyone who believes in him shall not perish, but have eternal life. 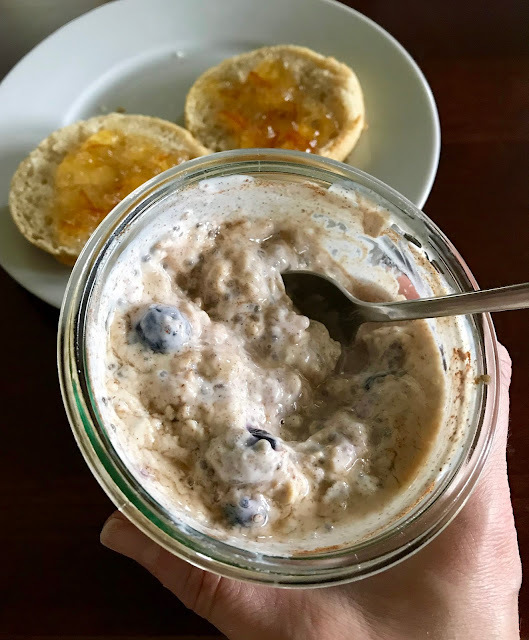 This recipe for overnight oats is adapted from one I found on a container of Siggi's yogurt, or skyr, actually – a thick, Icelandic-style yogurt. 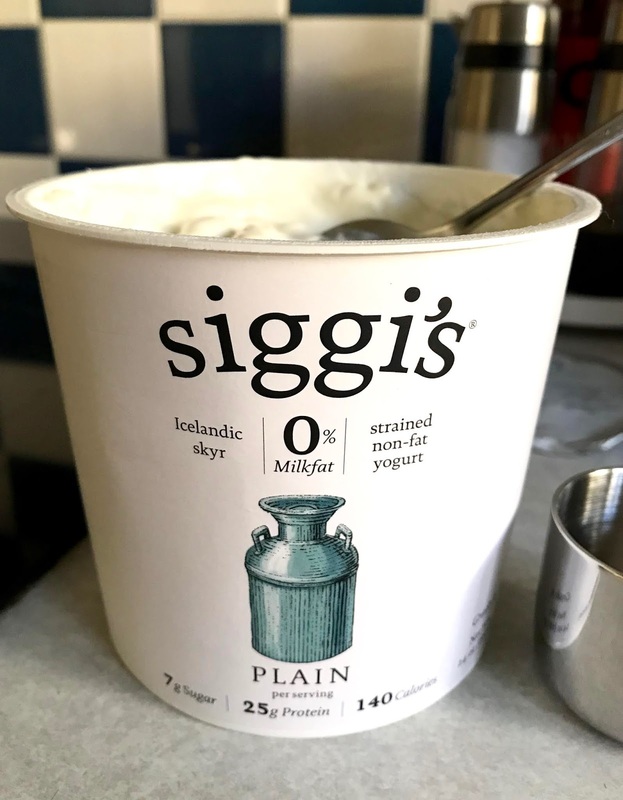 Siggi's is one of my favorite brands of yogurt. It is high in protein and low in sugar – at least 25% less than leading flavored yogurts, according to their website. The milk they use is sourced from family farms who don't use growth hormones. Their products do not contain high fructose corn syrup, aspartame, sucralose, gelatin, preservatives or artificial colors. I buy the large, 24-ounce container of vanilla-flavored Siggi's to use in my morning smoothies. It's a bit more expensive than some other brands, but I think the quality is worth it. 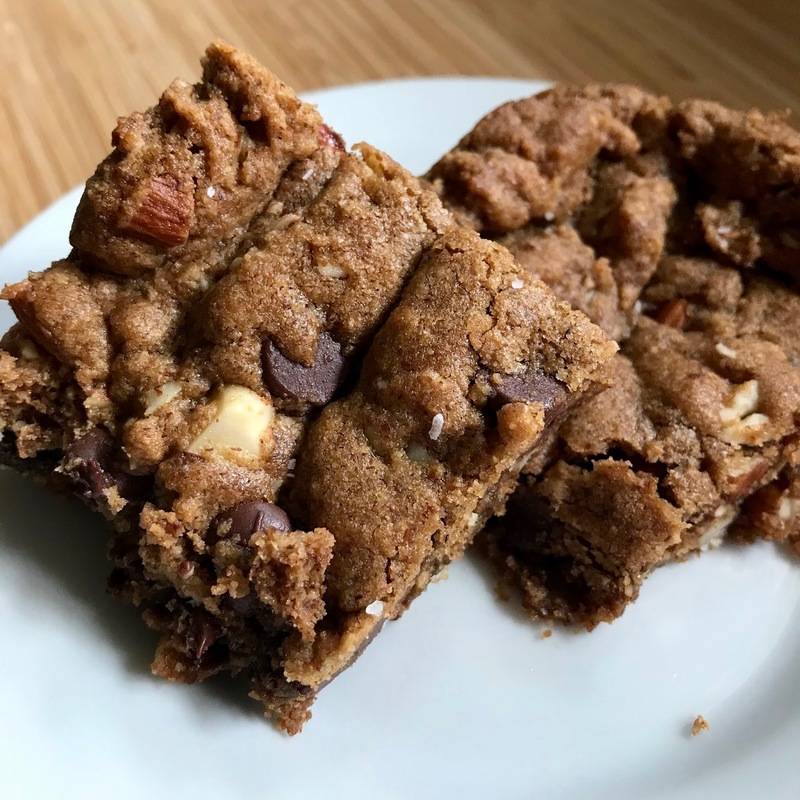 Visit their recipes page for more than 230 delicious-looking recipes – everything from pear and oat muffins to cauliflower soup to chocolate pot de creme. Combine all ingredients in a container that has a lid, and mix well. Cover with the lid and refrigerate 4 hours to overnight. Drizzle with maple syrup, if desired. May be served cold or warm. I really like these Weck canning jars for storage, and they are perfect for making overnight oats. I have them in various sizes, include a beverage jar. 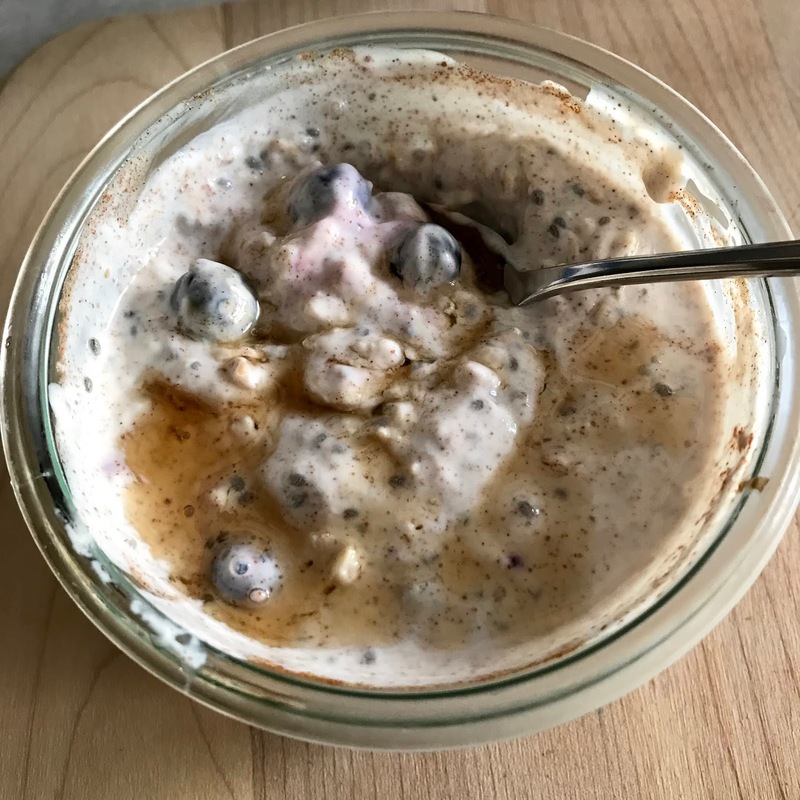 Below is what the overnight oats mixture looks like before refrigerating for several hours. 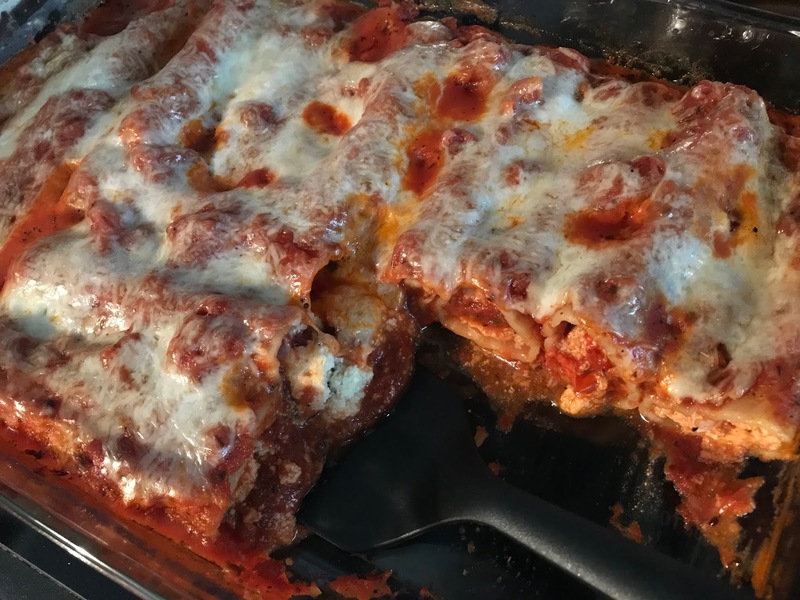 One of my favorite dishes to make is manicotti. My husband loves it, too. 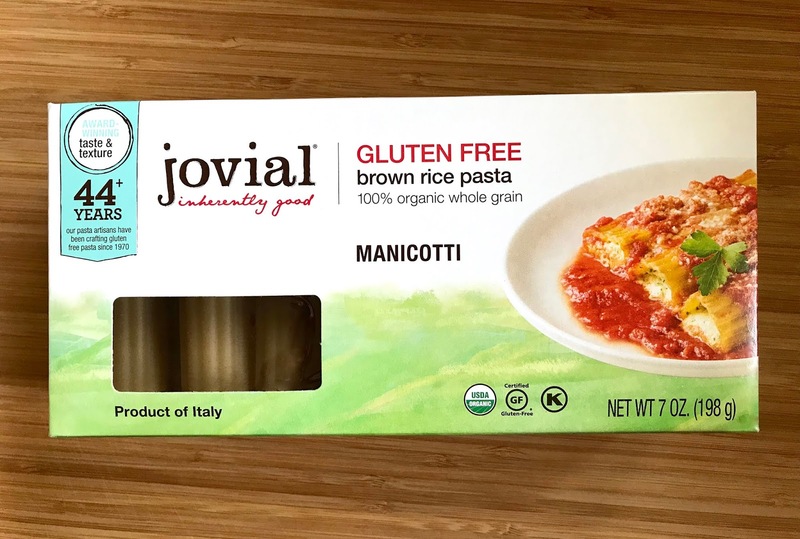 Because I have to follow a gluten-free diet, I use a brown rice manicotti pasta by Jovial, which is an excellent brand of gluten-free pasta. They also make einkorn pasta. Don't know what einkorn is? Read about it here. And check out the great recipes on their website, too. If your local grocery doesn't carry Jovial products, you can buy them from their website. I prefer to purchase in store to ensure the shells are not broken. My "test" is to gently tilt the box one way, then the other and listen for any shards moving around. A few times I've bought these manacotti shells, there have been two or three broken ones. I still cook them up and do a bit of a patch job once I've stuffed them. You can't even tell after they are baked. 1) Preheat oven to 350 degrees. Bring a large pot (4 quarts) of water to a boil. Cook noodles 4 minutes, stirring occasionally to prevent sticking. Remove with a slotted spoon and set aside. 2) In a medium bowl, combine the ricotta, egg, Parmesan cheese, salt, pepper and parsley. Stir well to combine. 3) Fill the manicotti shells with the cheese mixture. You can use a pastry bag (the kind used for cake decorating) or make one by snipping the corner of a plastic bag. I prefer to use a small spoon to stuff the shells. My technique involves gently shaking them to get the cheese to the other end of the tube, blocking the opening with a finger or two. This method may take a little longer, but I have good success with it. I also don't like to waste any of the cheese, which would happen if using a pastry or plastic bag. 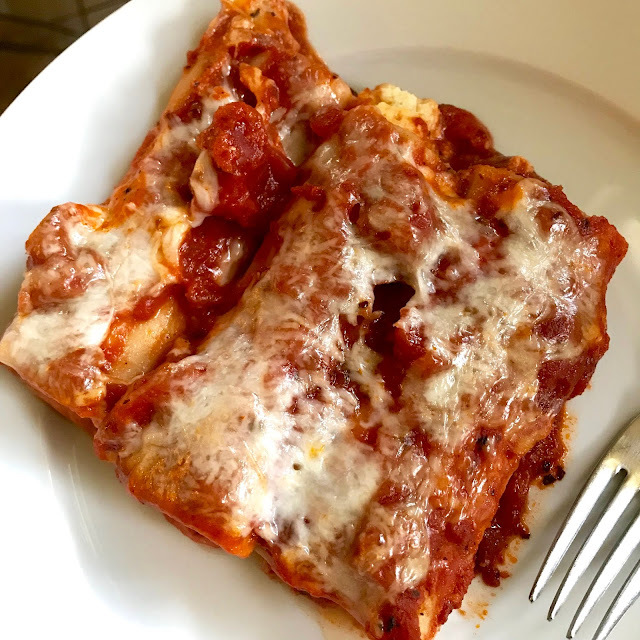 I find there is barely enough cheese to fill the manicotti shells, without any excess left over. 4) Coat the bottom of a 13" x 9" baking pan with about 1/3 of the pasta sauce. Place the filled shells on top of the sauce in a single layer. Top with the remaining pasta sauce. Sprinkle the mozzarella over the top. Cover the pan with foil. Bake for 40 minutes. Uncover and bake another 5 minutes or until the cheese is lightly browned. Just a quick post to share some photos I took today on my walk through the neighborhood with my pal, Henry. 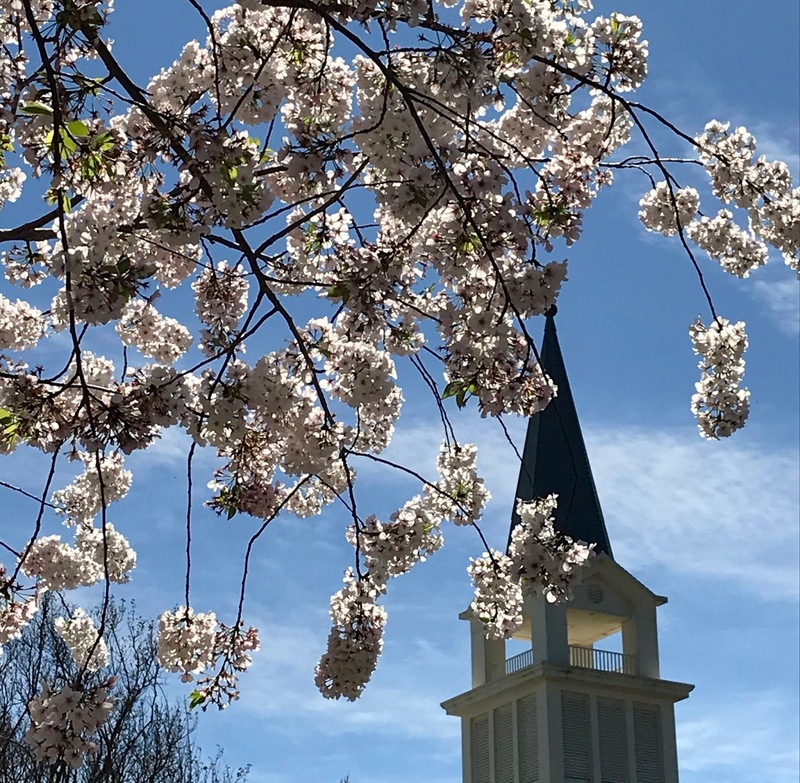 The weather today is perfect: sunny, breezy and 60 degrees. 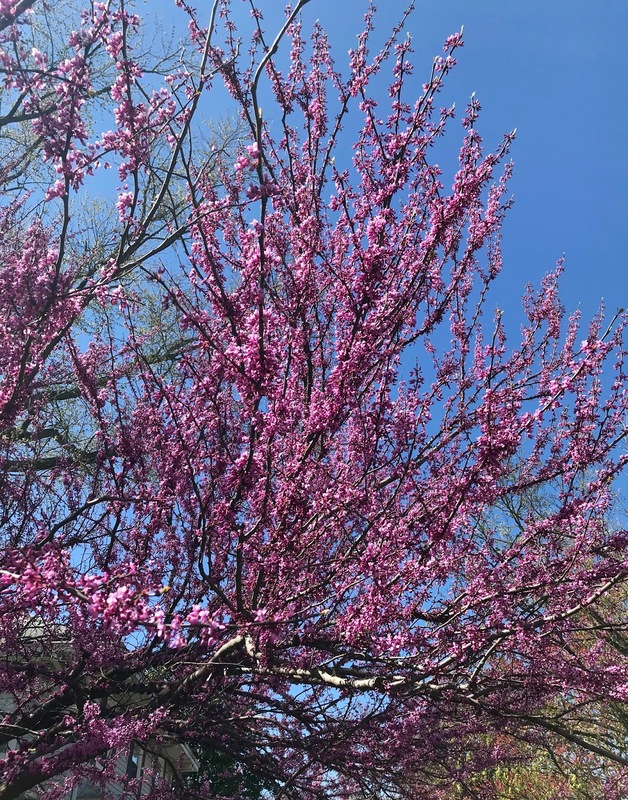 I hope you're enjoying spring's pretty blossoms and warmer temperatures where you live. Friends, I am so ready for spring! If you live in a cold climate, I'm sure you are, too. 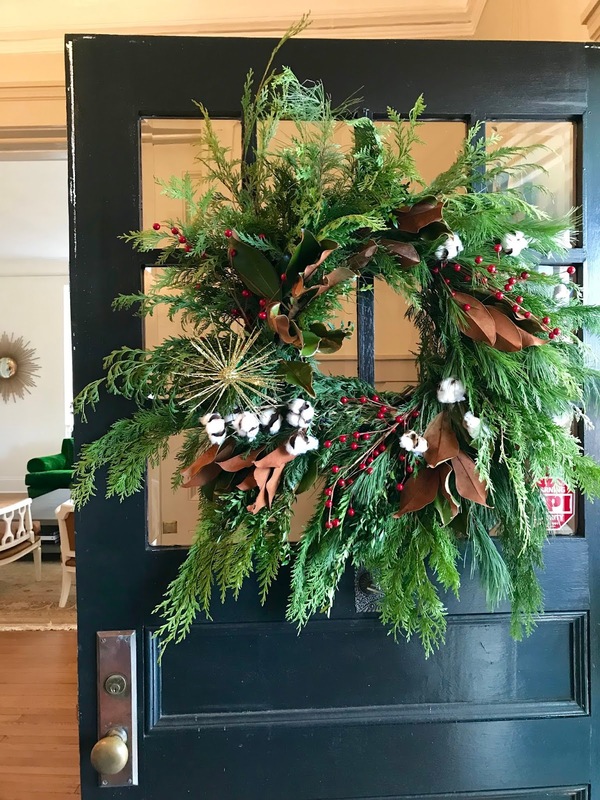 When the weather starts teasing us with temperatures in the 60's, I start daydreaming about how to fill my front porch planter and what plants to add to the back yard garden. My husband just planted more tubers in the dahlia garden. I'm so happy and can't wait to "meet" them! Dahlias are my favorite flowers. We leave the tubers in the ground through winter, rather than digging them up (like we should). Year after year, we've had fairly good success doing this. However, last year several plants didn't come up from the previous year, and they were pretty spectacular ones, too. I'm guessing this year's wet, cold winter may have taken a toll on more of tubers. We'll hope for the best. 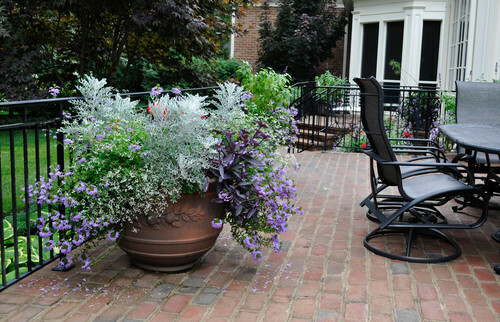 I came across an informative article on Houzz about container gardening and how to choose the right containers for your plants. 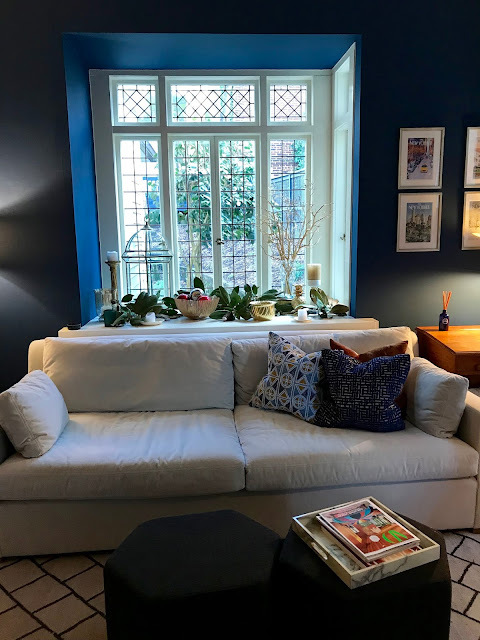 I wanted to share some of their lovely photos with you. I adore the first planter, with that single pink blossom balanced by the spiky, soft pink flowers and the dainty trailing white flowers. Perfection. I may try to replicate this. The containers below are just my style. I love their shape, and how the rust and bronze colors look together. Succulents are some of my favorite plants. They look really good in this type of container. However, this photo example goes against the advice in the article, which states that succulents prefer shallow soil, less than 6 inches deep. I'm sure there are ways to fill the bottom half to two-thirds of a planter like this with filler such as plastic bottles or wine corks or something, then line the top with some material that allows for drainage and add soil on top of that. It would certainly save on soil and make the planter less heavy. Let me know if you have any tips or advice that has worked for you. The next photo shows how annuals look toward the end of the season, which is normal and does not mean the plants need to be repotted. Annuals can simply be removed and disposed of at the end of the season, while flowering perennials can be cut back. Root-bound perennials can be divided and replanted in other containers or in the garden bed, where they'll come back next year. Regarding container size, base it on the amount of room a plant's roots need and how large the plant is expected to grow. 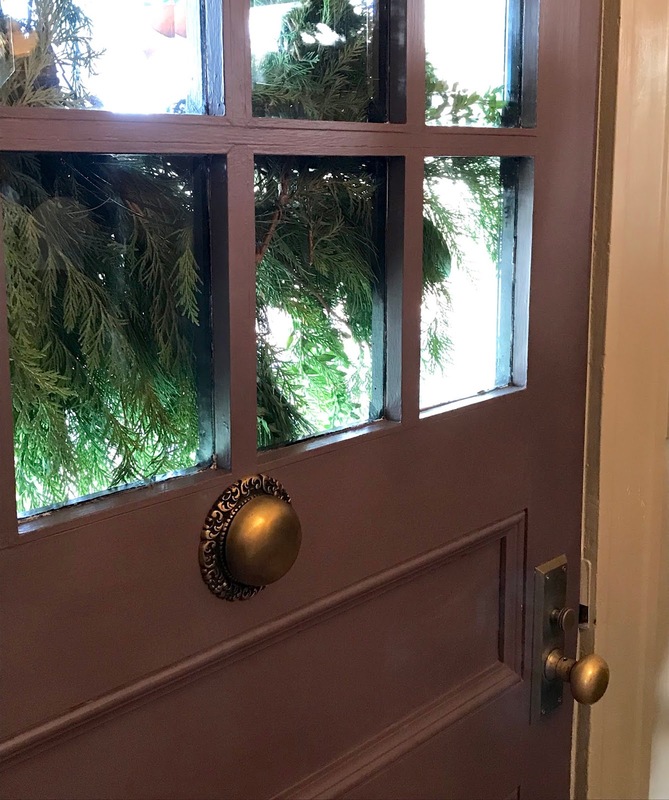 A plant in a container too small will not be able to grow to its full potential, its roots will become root-bound and the soil will dry out too quickly. 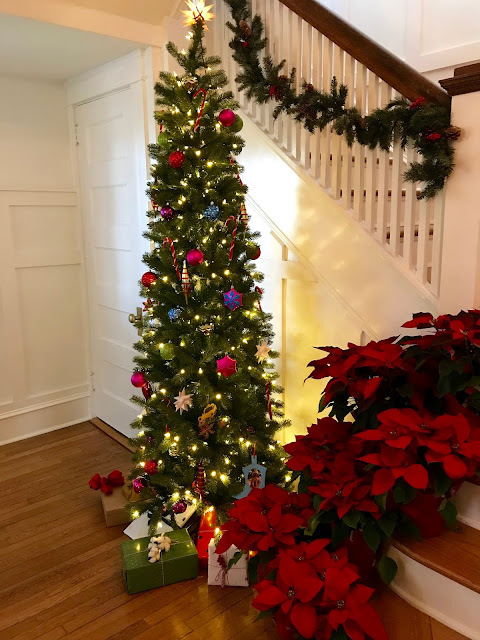 If a small plant is put in a container that is too large, the plant's roots may not reach the bottom of the pot and will not get the moisture it needs. 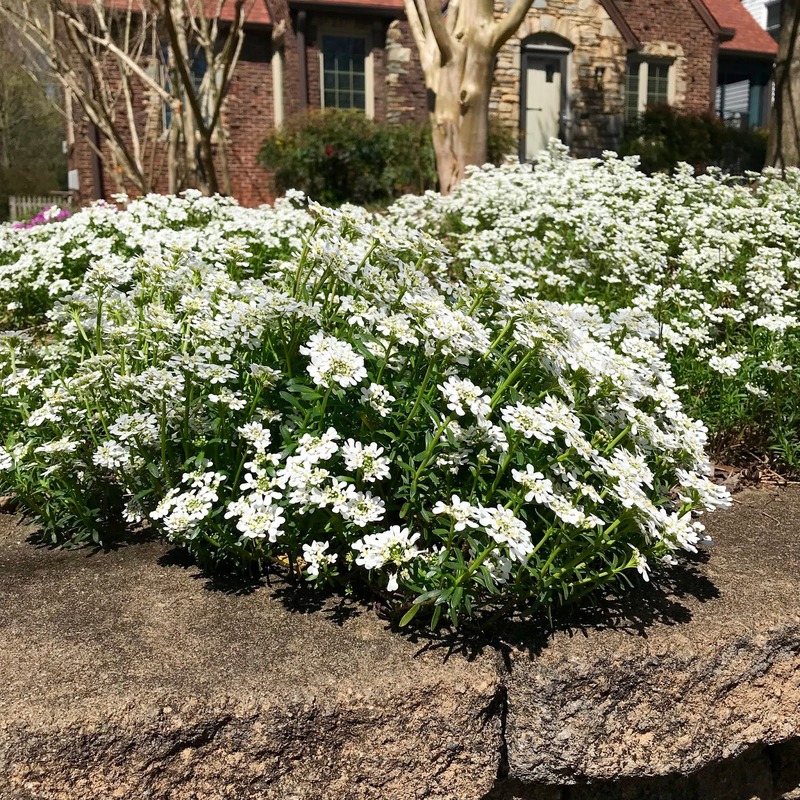 As a guide, annuals need a soil depth of 12 inches while perennials need 12 to 18 inches. 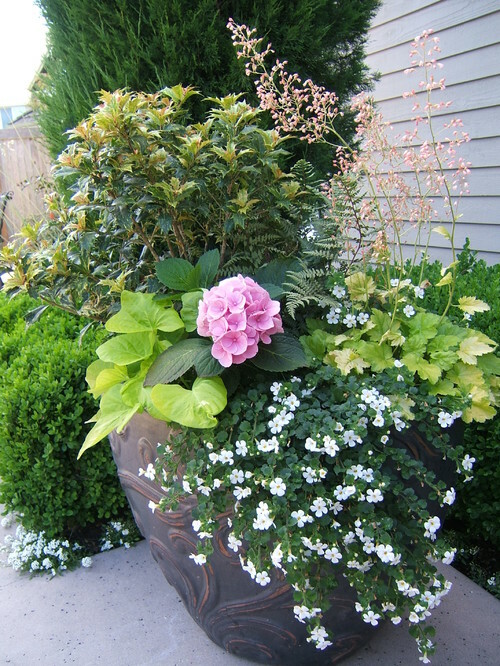 If you plant shrubs in pots, allow 18 to 24 inches. Edible plants such as herbs and vegetables need varying planter depths. Shallow-rooted crops like lettuces, radishes and strawberries can grow in 6 to 12 inches of soil and can be grown together in the same planter (make sure it's big in diameter). 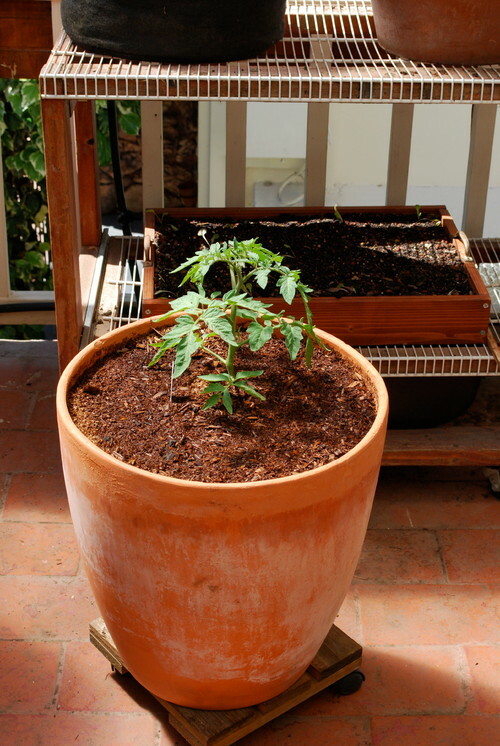 A tomato plant, below, needs plenty of soil depth, preferably 2 feet. It should be planted alone in order to get the healthiest plant and best crop. Read the plant label for guidance and base the container size on the maturity size of the plant. 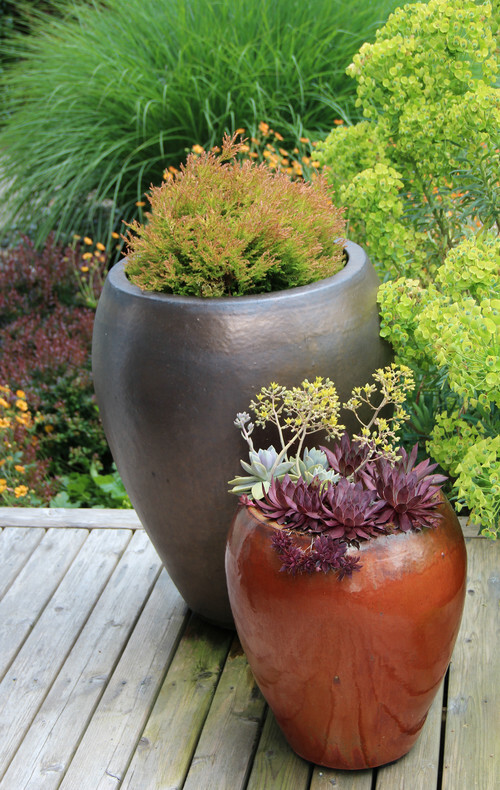 When you first pot the plant, it may look tiny in a very large, deep pot, but as the plant grows, it will quickly take up the space! I made this mistake last year by planting a cherry tomato plant in the same planter as parsley and some other herbs. The single tomato plant quickly took over and crowded out the herbs, except for the parsley – which amazingly survived over the winter and is looking beautiful! I hope you have fun with your spring planting! I'm thinking of adding some succulents to my front porch planter this year, combined with the usual asparagus fern and a few flowers. That might make for an interesting combination. 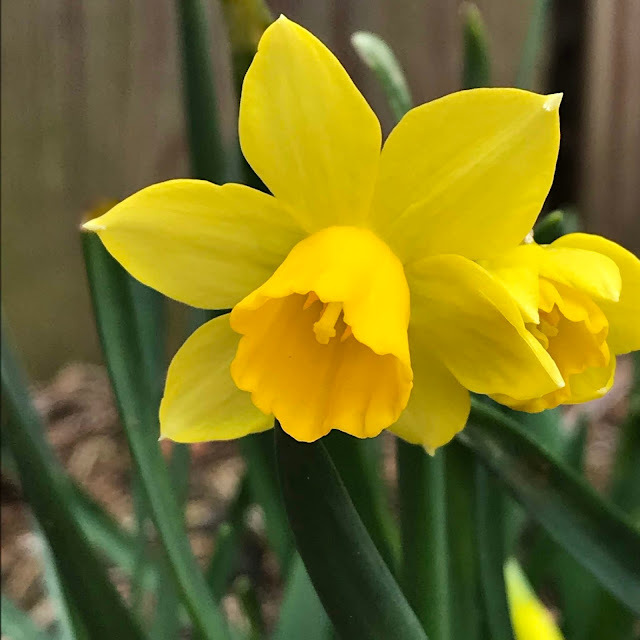 What do you have planned for your garden this year? Howdy, friends! Sorry I have been delinquent with blog posts of late. I am on a new assignment at work and have been working longer hours, which leaves little brain power for creating posts. I am enjoying the new challenge, though, despite the longer hours. This week I strained my lower back and have been hobbling around in great pain. I'm on my second day of Prednisone which helps immensely after just the first day; I will take it only for only six days. I am hoping to feel much better this weekend so I can get a lot done around the house. I wanted to share with you this new indoor-outdoor runner, 2.5 x 9-feet, that I purchased from Rejuvenation. 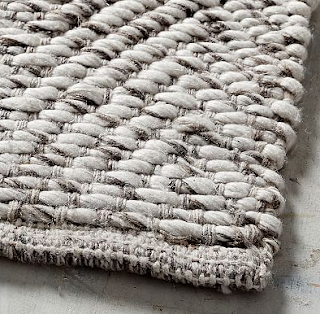 It is called the Cleary rug and is made of recycled plastic, but doesn't look or feel like it. Indoor-outdoor rugs are essential with two senior dogs in our household. 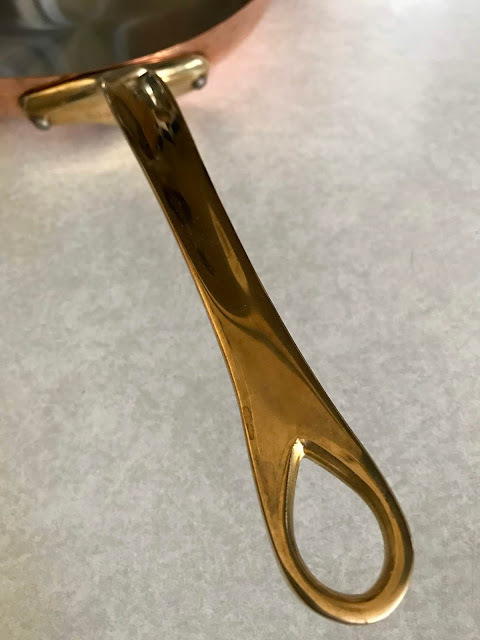 I love them because they are so practical and can be cleaned when one of the pups gets sick or, in the case of our elderly beagle, has a potty accident on it. The indoor-outdoor rugs we have don't stain after being cleaned, unlike many natural jute or seagrass rugs. I put this photo on Instagram (@claudiabungalow) and one of my IG friends commented on our wood floors. 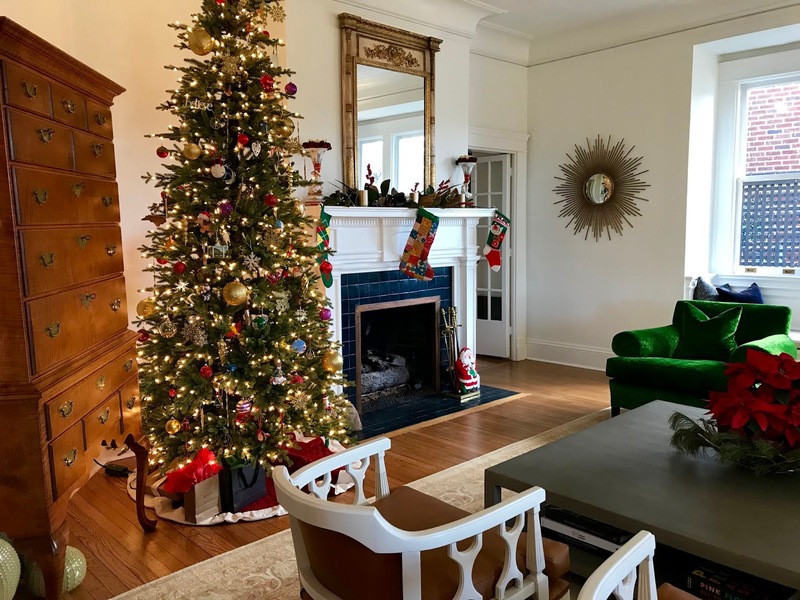 I thought I'd mention they are nearly 100-year-old heart pine floors. 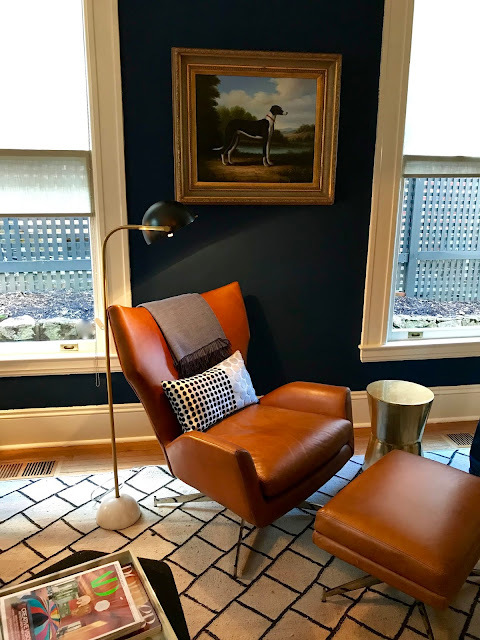 We had the living and dining room floors refinished, but didn't do the three bedrooms at the time – that was a mistake, by the way. I wish we had just packed up all our furniture and had all the floors refinished. Oh well, maybe one day. Pine is soft wood and scratches easily. Our dogs, present and past, have made their mark on all our floors, but the living room and dining room still look really nice. In this entry space, we are going to alternate this rug with a natural fiber runner to have some variety. We have had great luck with the natural fiber runner so far – it has been peed on three or four times, and each time my wonderful husband will haul the thing outside and scrub it clean with a disinfecting cleaner and hose it off. We hang it over the fence to dry in the sun and it ends up looking like new! 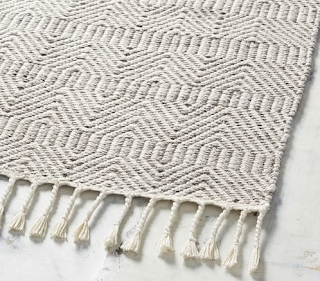 Are you a fan of indoor-outdoor rugs? 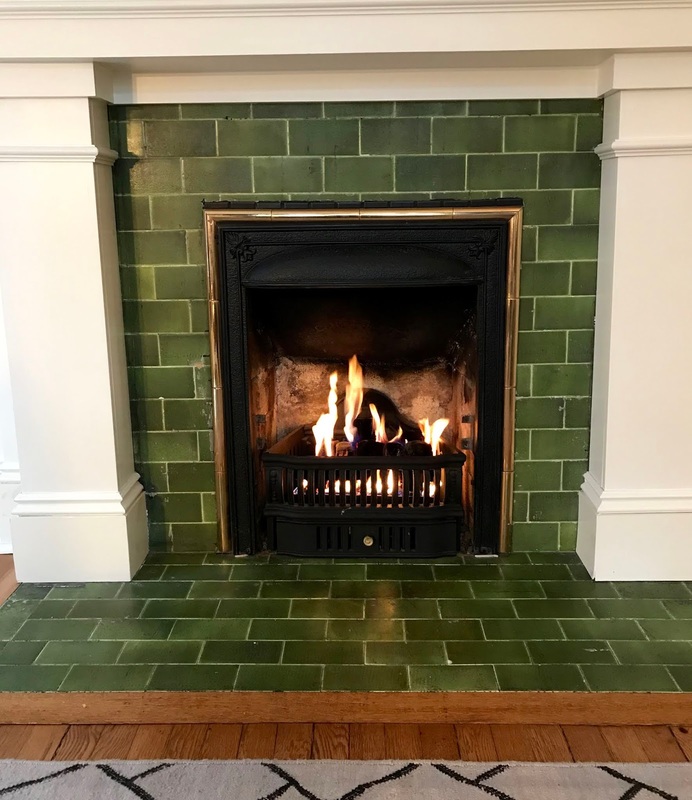 The quality has come such a long way over the years with a wide variety of styles and textures. I love them! If you like peanut butter and chocolate – particularly the two together – and you're a fan of oatmeal, you'll probably like this peanut-butter-cup oatmeal, my take on a recipe I saw online. 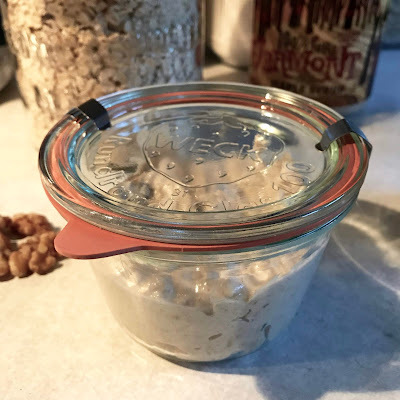 I love the flavor of peanut butter in the morning (I frequently add it to my smoothies) so I substituted it for the almond butter called for in the recipe. 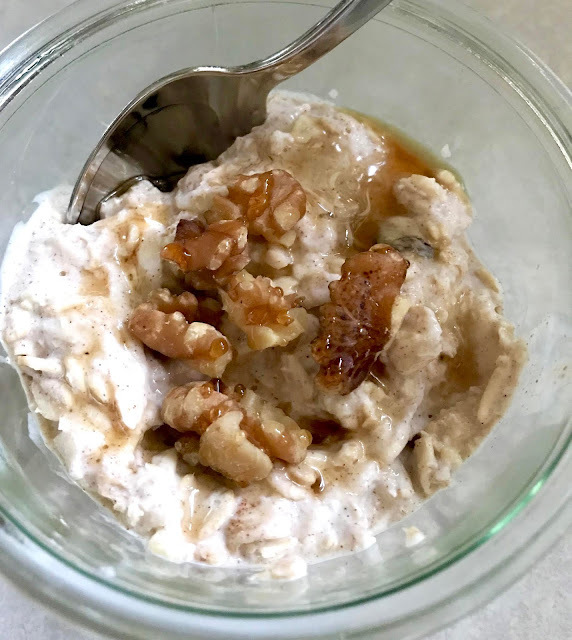 Oats contain soluble and insoluble fiber, which are both beneficial to health. Soluble fiber absorbs liquid, expands and moves bulk through the digestive tract. In short, it helps keep you regular. The bulk also helps prevent the absorption of cholesterol, which is why oatmeal is a good food source for reducing cholesterol. 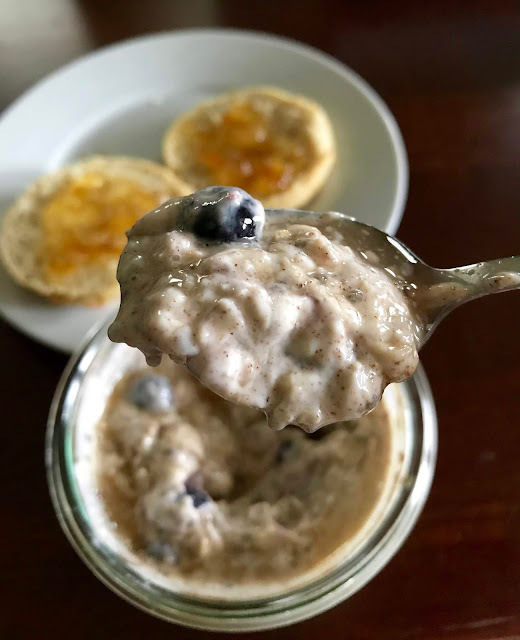 I'm fortunate I don't have cholesterol issues, but several years ago I was on an oatmeal kick, having it for breakfast nearly every morning for an extended period of time. My cholesterol numbers went from good to even better in a one-year period. 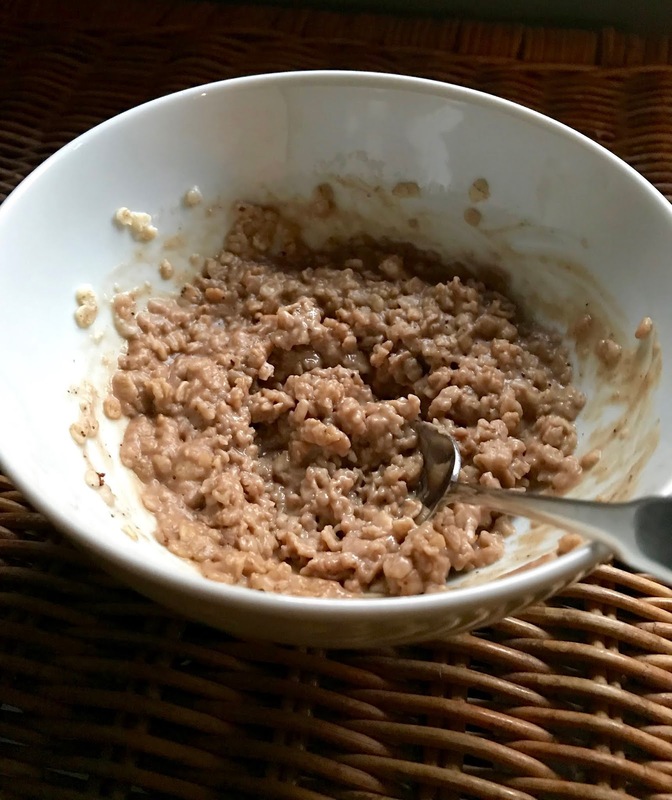 Could be due to eating oatmeal, and I was exercising regularly at the time, which helps raise HDL (high-density lipoprotein), or "good" cholesterol. Check out this WebMD page to learn more about cholesterol. Natural, non-alkalized cocoa powder also has health benefits, including antioxidants. When alkalized, though, the antioxidant benefits are lost. 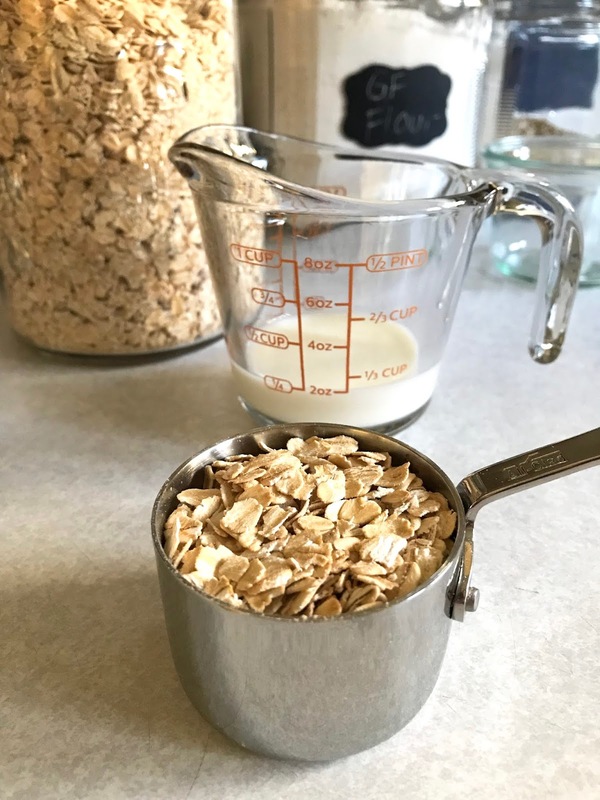 1) In a microwave safe bowl, combine the oats, almond milk and salt. Cook on high for 1-1/2 to 2 minutes. Remove from microwave. 2) Add the honey, cocoa powder and peanut butter. Stir to combine and enjoy! This is not a sponsored post, but I encourage you to visit the McCann's website for more information about their products and some great sounding recipes. 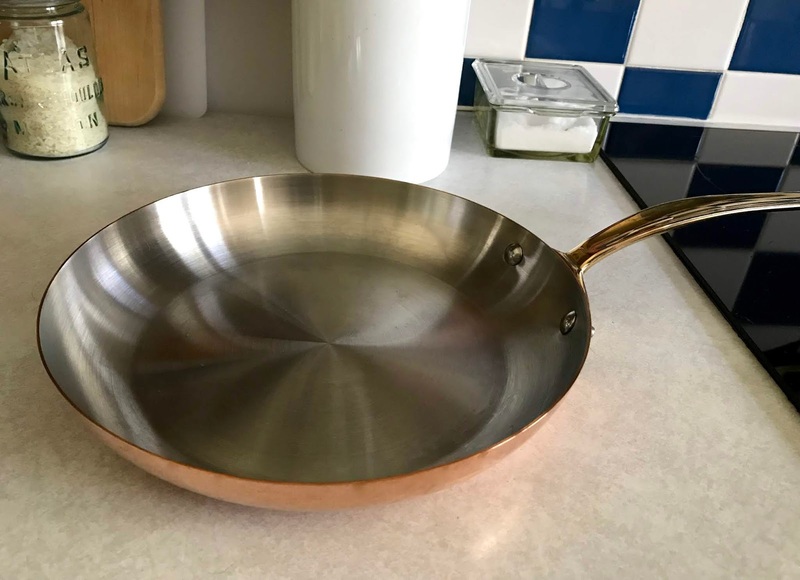 I purchased my first piece of copper cookware last month – a Mauviel 10" copper and stainless frying pan. I'd been wanting to find an alternative to the two non-stick fry pans we use regularly. One is Calphalon, which is beginning to get some scratches, and the other, larger fry pan with a glass lid is by Le Creuset, a brand I like very much (I have two Le Creuset sauce pans and they are great quality). I researched alternatives to non-stick cookware, from ceramic non-stick to GreenPan to stainless. 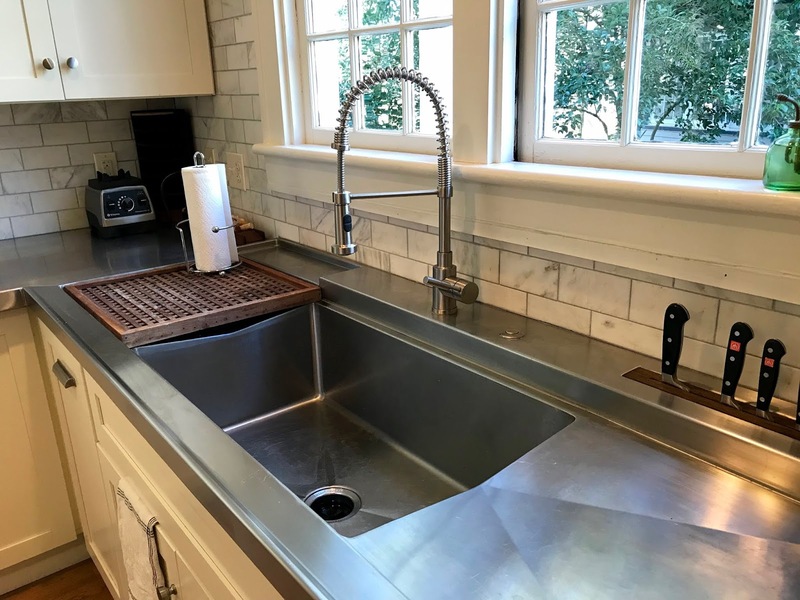 The only issue with stainless is the potential for food to stick. 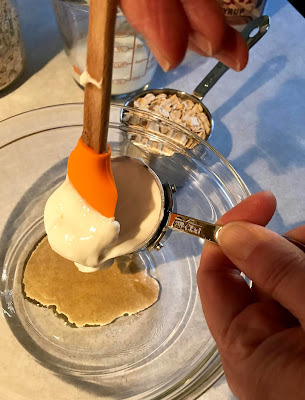 My husband prefers non-stick pans for this reason, but I wanted to add a healthier option to our cookware – one without the chemicals that come with non-stick pans. So after doing a bit of research, I landed on a Mauviel copper and stainless frying pan. 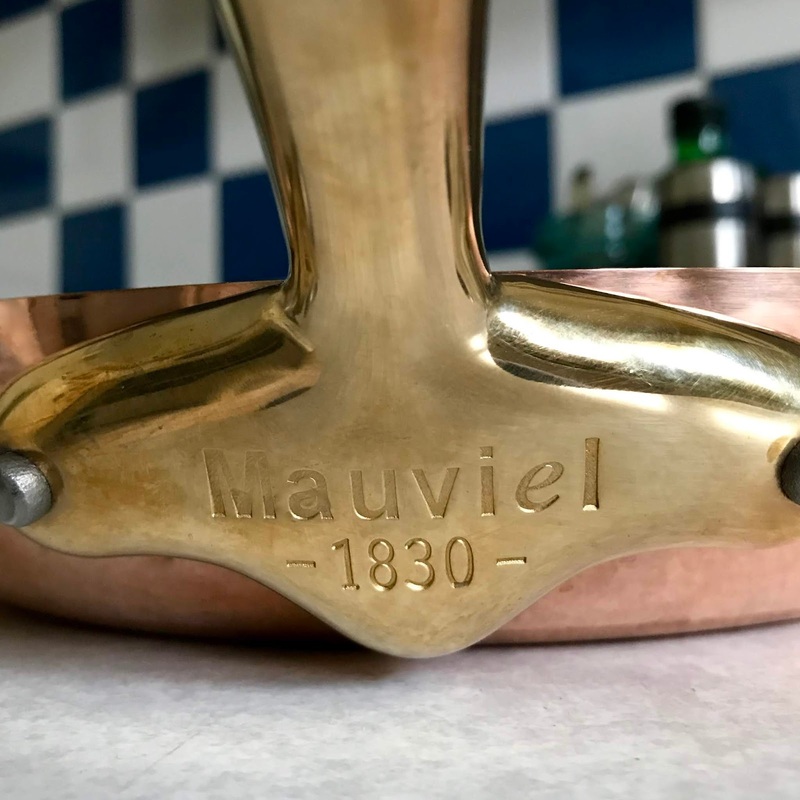 Mauviel is a French, family-owned company that has been making exceptional handcrafted cookware since 1830. Read more about them and meet the craftsmen here. 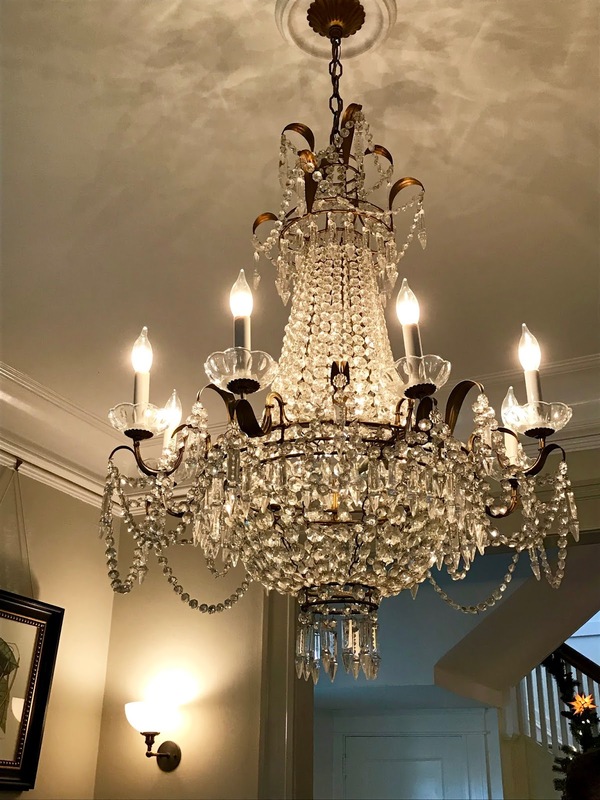 The craftsmanship is reflected in the price of Mauviel products. At Williams Sonoma, this pan retails for $179.95. I wouldn't spend that much on one piece of cookware, but I had a couple of incentives. First, there was a 20% off sale, which brought the price down to $143.96. Then I was able to use a $25 birthday certificate PLUS three $25 Williams Sonoma rewards certificates. So I ended up paying less than $44 (before tax) for this lovely pan! My husband installed a hook above the stove so I can enjoy seeing it every day. 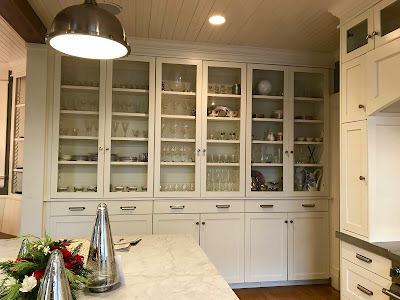 I love the color it adds to the kitchen. It's too pretty to hide away in a cabinet! Because I was a bit nervous about the food sticking issue, I asked a lot of questions before making the purchase. The sales associate at Williams Sonoma was super helpful. She recommended always using low heat (certainly no higher than medium). Since copper heats faster and more evenly than other metals, using heat that is too high isn't necessary and can actually damage the pan. Using oil or butter is important in preventing sticking. She also warned me never to use cooking spray on this pan, which leaves a permanent residue. This morning I fried two eggs in my pretty new pan – my first experience cooking eggs in it and the true test. Before today, I'd only used it to make grilled cheese sandwiches and cook up some ground beef (for the dogs, not for me!). I used a small amount of avocado oil and heated the pan on low (number 2), lowering it even more once I added the eggs. As they cooked on this low temperature, I used a plastic spatula under the edges periodically to prevent sticking. When it came time to flip them, they released easily, but there was a thin layer of egg that stayed on the surface of the pan. That made me a little nervous. 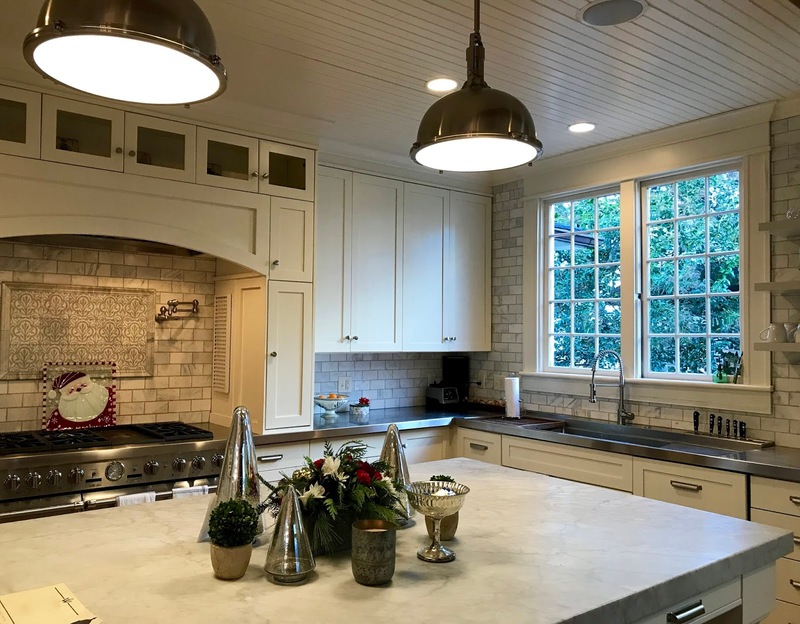 Once I was done cooking, I followed the other piece of advice the sales associate gave me: I added hot tap water to the pan (enough to cover the residual egg) and returned it to the stove, letting it sit over the lowest heat setting while I ate. When I was ready to clean up, I used the spatula to scrape the bottom of the pan, and the bits of residual egg came right off. Then I just washed the pan with soap and water. Below is the pan, post eggs. Turned out great! On a previous occasion when I cooked some ground beef with a small amount of oil, but on a higher heat setting (number 4), there were some marks that didn't come off after washing. I used a small amount of Bar Keepers Friend and a wet dish cloth and it shined up like new. I use Bar Keepers Friend on our stainless kitchen sink too; it's a great product. 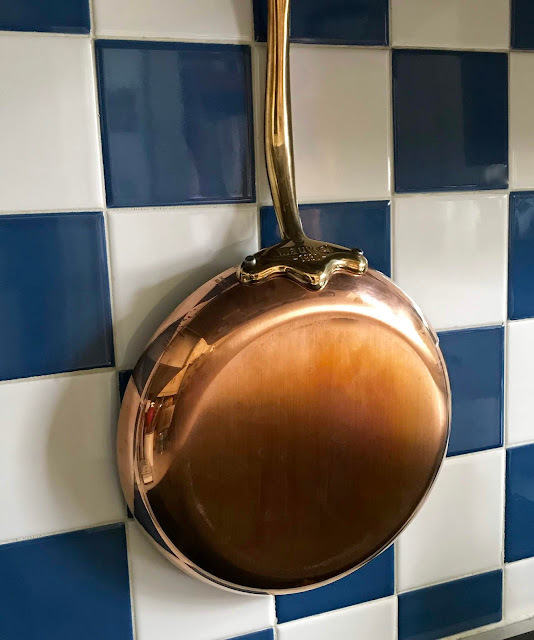 Copper cookware does require a bit more maintenance than other types, especially if you prefer a shiny and bright finish. Mauviel recommends Copperbrite; see this page for steps on how to clean copper. I prefer a bit of patina on my copper, though, so I won't be cleaning my pan as often. The brass handle also gets a patina on it that I like, and has a large hole in the end for hanging. I'm so glad I made this purchase. 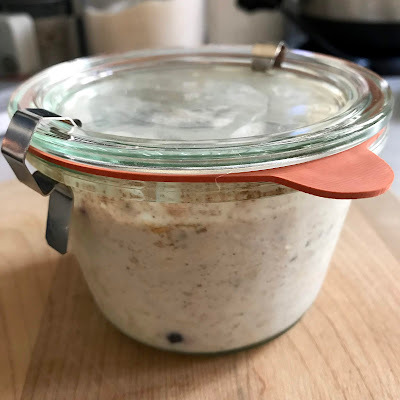 It's a pretty and useful addition to my kitchen cookware – and it gives me the feeling of a professional French chef, even though I'm far from being one! Here's an easy treat to make for your loved ones this Valentine's Day – or whenever you're in the mood for chocolate! The recipe, from an old issue of Everyday Food, uses cornflakes, but as I read the ingredients label on a box of Kellogg's Corn Flakes, I saw "malt flavor" listed, which is not gluten free (nor was the box labeled "gluten free"). So, I had to find another cereal option. After some internal debate, I chose the grocery store brand of crispy rice cereal, which is labeled gluten free (ingredients listed: rice, sugar, corn syrup, salt). If you don't follow a gluten-free diet, you can use cornflakes or crispy rice cereal. Corn or Rice Chex might work also, but the squares would have to be broken up. The nice thing about the crispy rice cereal is the size – no extra labor required to make the pieces smaller. Whatever your plans this Valentine's Day, I hope you spend it with those you love. And indulge in a little chocolate! Note: if using cornflakes, use the same amount, but break the flakes into small pieces using your fingers. 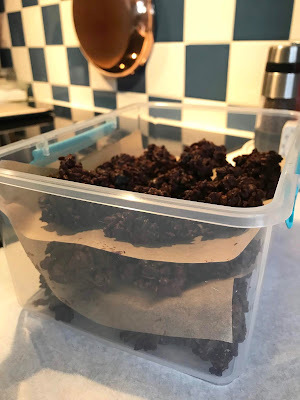 Note: I used a combination of dried tart Montmorency cherries, which are a little sour, and dried Bing cherries, which are sweeter – both from Trader Joe's. 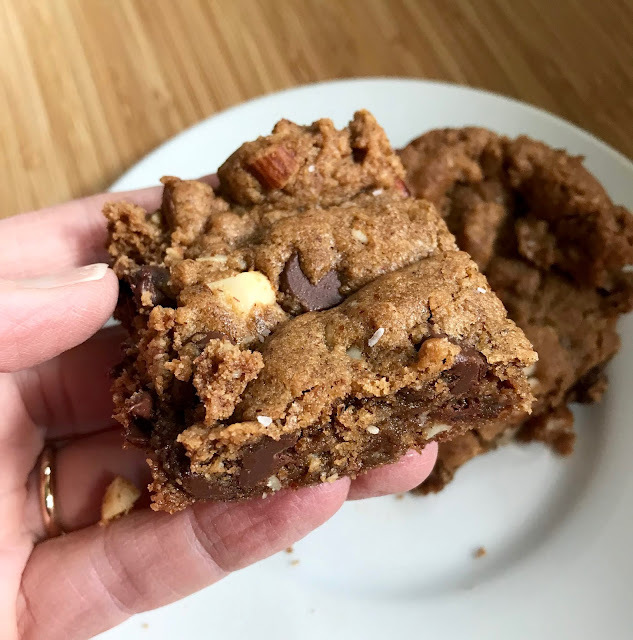 Note: I used two 4-ounce Ghirardelli bittersweet chocolate baking bars for a total of 8 ounces, but the original recipe calls for 10 ounces of bittersweet chocolate. In my opinion, 8 ounces is sufficient. 1) In a large bowl, combine cereal and cherries; toss to combine. 2) In a medium saucepan, bring a small amount of water to a simmer. Place a medium, heatproof glass bowl over the pot, making sure the bowl does not touch the water. Put the chopped chocolate in the bowl; stir occasionally until the chocolate is melted. Remove from heat. Carefully remove the bowl, using a dish towel to remove the condensation from the bottom of the bowl. 3) Pour the melted chocolate over the cereal mixture. Using a rubber spatula, gently stir until the cereal and cherries are completely coated with chocolate. 4) Drop by heaping tablespoonfuls onto two parchment-lined baking sheets. Leave sheets in a cool, dry place for an hour or until clusters are set. Store in an airtight container for up to 1 week. Note: If you need to stack the chocolates in your storage container, try using pieces of parchment paper between the layers to prevent sticking. For efficiency, I reused the same parchment that lined the baking sheets. I could never start the day without breakfast. Most mornings I wake up hungry. I start thinking about what I'll have for breakfast before I'm even out of bed! 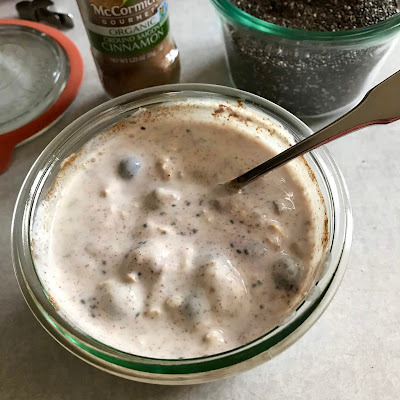 My usual breakfast is a smoothie made of yogurt, almond milk, banana (fresh or frozen), whey protein powder, kale, peanut or almond butter, rolled oats, cinnamon and flax seed oil. But preparation takes a bit of time, and there's clean-up of the blender, and some mornings I wish I had something ready to eat. Then I was introduced to overnight oats. On the back of the foil cover of a large container of Siggi's yogurt, I saw a recipe for apple pie overnight oats. I gave it a try and really liked the results, though my husband thinks it's too thick. I suppose it could be thinned with a little milk before serving. 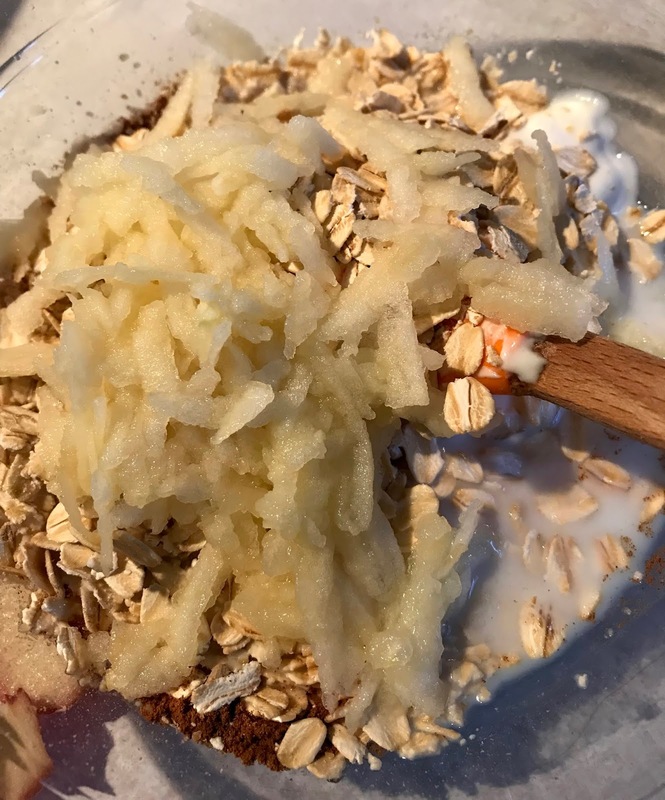 The benefit of this recipe, as suggested in the name, is that you make the oats the night before, so it's ready to eat in the morning. No excuse to skip breakfast! I like Siggi's yogurt because it's high in protein and low in fat. Their vanilla flavor is not too sweet, and has a nice subtle vanilla taste. 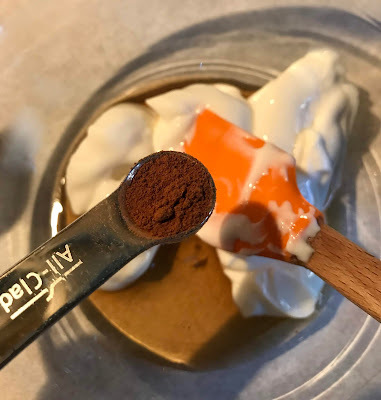 Find more Siggi's recipes here. 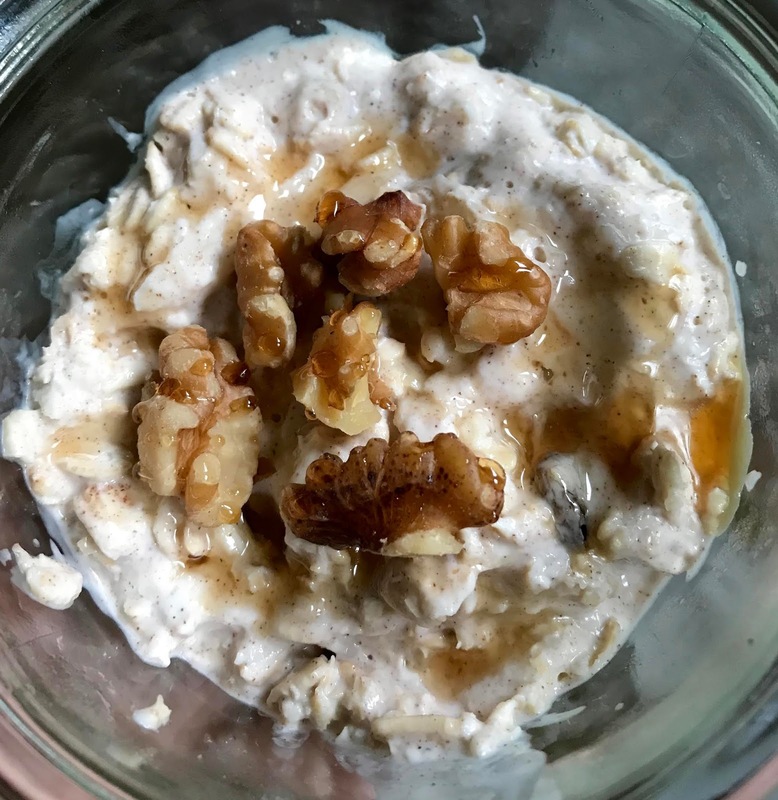 In a jar, mix all ingredients, except walnuts, together until well combined. Cover with a lid or plastic wrap and place in the refrigerator overnight. In the morning, top with walnuts and a drizzle of maple syrup. Are you a football fan? I grew up watching football on Sundays with my dad. We used to play "name that team." My dad would say a city and I'd give the name of the team, or he'd give the name of a team and I'd say the city. It was a fun time of bonding with my dad. Today, neither my husband nor I are not regular watchers of football, and we have no allegiance to any one team, but we do enjoy watching the playoff games and the Super Bowl. In this past weekend's playoffs, we were pulling for the New Orleans Saints and the Kansas City Chiefs. Both games were so close and exciting, each going into overtime. I love a close game! Sadly, neither of our teams won. All this time watching football got me thinking about ideas for a football-related blog post. 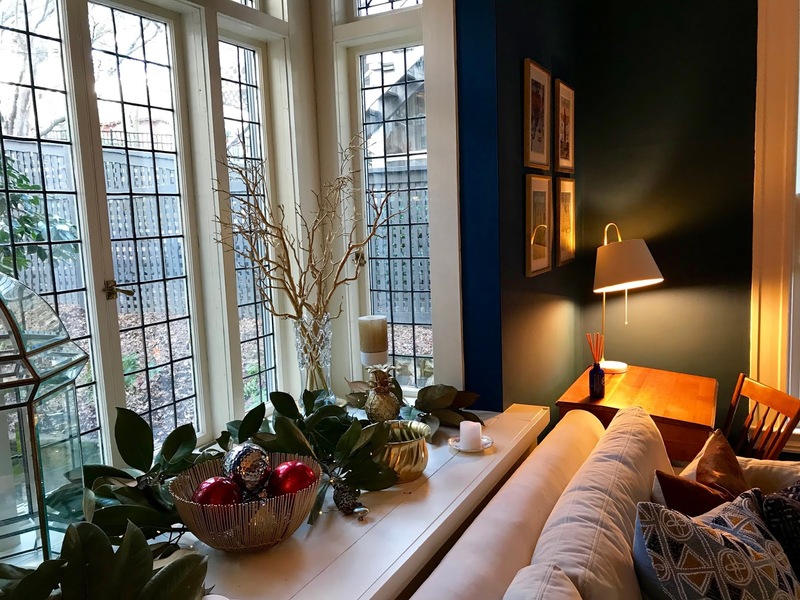 I thought it would be fun to feature some dreamy spaces for watching the Super Bowl. 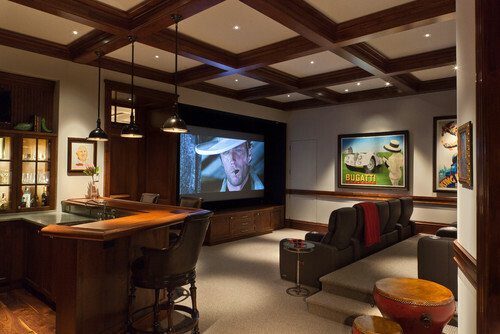 I searched "home theaters" on Houzz and couldn't believe the extent to which some people go to create extreme home theaters. It's unreal. Some of them are as large and elaborate as actual theaters, complete with concessions stands even! The rooms below are more modest than those, but still much nicer than the average TV room. 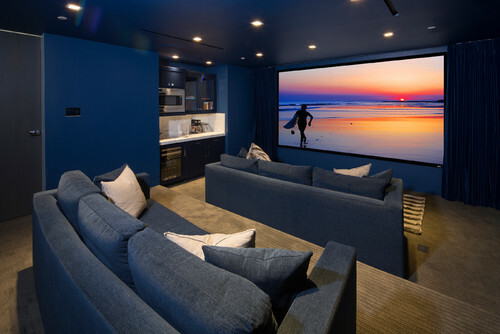 My checklist for a dream home theater would include three things: a large-screen television (of course), a cozy seating area and a bar for serving drinks and snacks. The first room below is my favorite of the three. Which do you like best? If you're hosting or attending a Super Bowl party this year and are looking for recipe ideas, check out my posts for spinach-artichoke dip, 8-layer dip, veggie chili, vegetarian nachos, guacamole, and spicy toasted pepitas (pumpkin seeds). Would you like to see more Super Bowl recipe ideas here on the blog? Leave a comment and let me know. And enjoy the game on February 3rd! Hello and happy New Year to you! Sorry I've been off the radar the past month. I must have needed a little break. December marked My Little Bungalow's eighth anniversary. It's hard to believe I've been blogging for eight years! So, how was your holiday? I hope it was wonderful. Ours was. 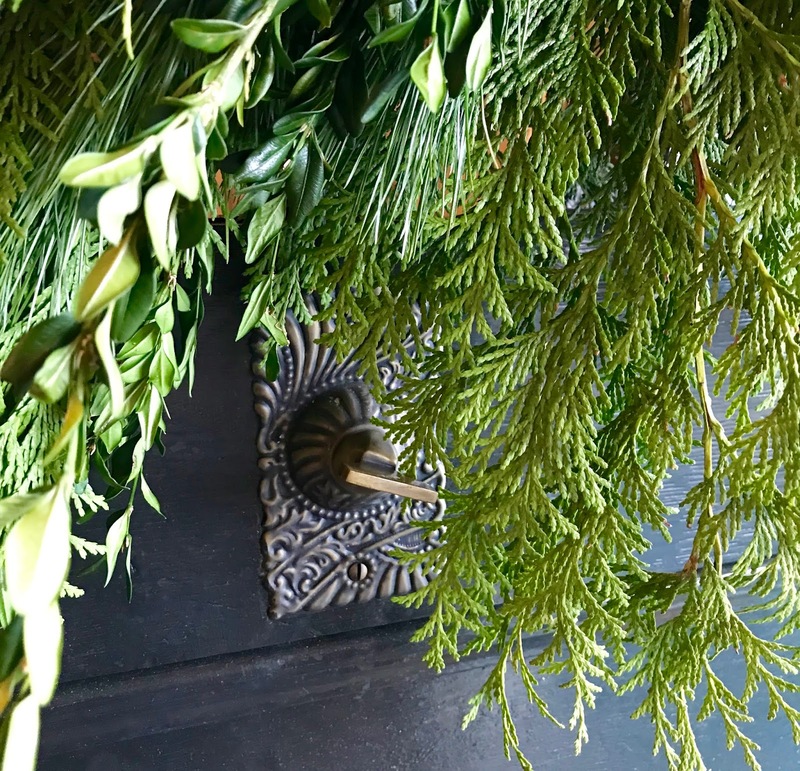 On Christmas eve, we attended Mass at 4 pm, the first of four services our church has on Christmas eve. The church was packed – standing room only! On Christmas day, I prepared a simple meal of chili and gluten-free corn bread, like last year. And for dessert I made a pumpkin pie. Nothing fancy, but it was tasty and satisfying. On New Year's Eve, my husband and I attended a symphony event which we enjoyed very much. Then, this past weekend, we celebrated my birthday with a fantastic dinner out at one of our favorite restaurants. We started by sharing an appetizer of roasted Brussels sprouts with the most delicious orange-chipotle sauce I've ever tasted – it was all I could do not to lick the plate. As a main course, I chose the red snapper, which was perfectly cooked, with sauteed kale and roasted golden beets, and for dessert I had a flourless chocolate torte with raspberries and whipped cream. My husband had vegetable lasagna with a side salad, and coconut cream pie for dessert. Delicious! So here we are in mid-January, with weather that certainly feels like winter. The weekend brought freezing rain, but we were blessed that our power stayed on. Many surrounding neighborhoods and towns lost power caused by falling trees and downed power lines. Except for heading to the pool to swim and going out for my birthday dinner, I stayed indoors. I'm reading a really good book, Jewel, and it was the perfect weekend for snuggling up with a book. My husband and I aren't regular watchers of football, but we enjoyed the Saints-Eagles game on Sunday (go Saints! ), and during half time I tried out a new gluten-free dessert recipe, altering it some. 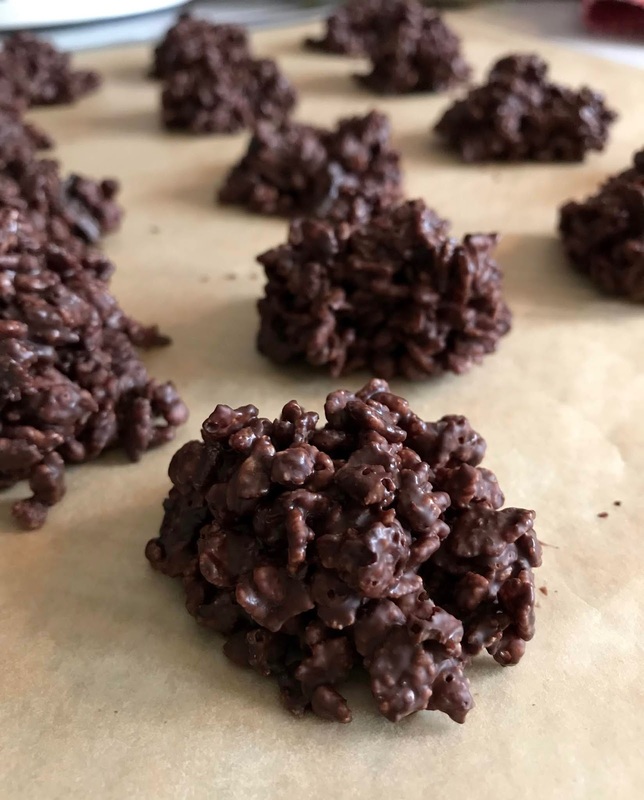 It's so tasty and so easy, I wanted to share it with you. Plus, it's gluten-free! Give this one a try. 1) Preheat oven to 350 degrees. Line an 8"x8" baking pan with parchment paper. 2) Put all ingredients in the bowl of a stand mixer and mix until well incorporated. This only takes a minute. 3) Transfer the dough to the lined pan, spreading and pressing down evenly. Bake 22 to 25 minutes until set. Remove pan from oven and place on a wire rack. 4) While warm, sprinkle just a pinch of coarse salt over the top. Let cool thoroughly in pan before cutting into bars. Be sure to cool completely before cutting, otherwise the bars will crumble. Enjoy!